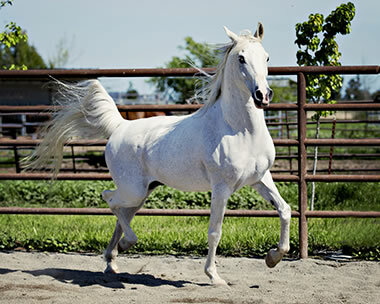 AURELIUS GOA is a multiple champion sport horse in hand in both Arabian competition and against all breeds. His heritage is a superb combination of athletes with a CMK sire from lines noted for National level success in sport horse competition and a regional champion producing dam whose athletic heritage is in top level saddleseat disciplines. AURELIUS GOA is by country pleasure reserve champion MAGIC AULRAB, sire of regional sport horse in hand winner and successful endurance horse AUL THE MAGIC (1945 career ride miles in 59 competitions), of 2018 U.S. Top Ten Dressage Type Sport Horse Under Saddle, First Level Dressage AOTR and First Level Dressage ATR AUL SABA+//, of regional champion sport horse under saddle and multiple regional sport horse in hand. sport horse show hack and dressage winner MAGICAUL SEEKRET GOA, of regional champion sport horse in hand MF DARYOOSH, ?of multiple U.S. Top Ten First Level Dressage, regional champion sport horse in hand and multiple regional champion sport horse under saddle MAGICAUL POWERS+/, and of regional champion sport horse in hand and multiple regional champion sport horse under saddle AUL THE MAGIC. MAGIC AULRAB has also sired the successful endurance horse and AUL A FROLICK (1080 career ride miles in 31 rides). MAGIC AULRAB represents the very successful nick of National Champion sire AULRAB on a daughter of U.S. National Champion Western Pleasure *LEWISFIELD MAGIC+//. He is a 3/4 brother to U.S. Reserve National Champion First and Second Level Dressage AUL MAGIC+/, sire of National Champions in dressage, sport horse in hand, sport horse under saddle and working hunter. AUL MAGIC+/'s get include multiple National Champion Dressage and National Champion sire AULWAYS MAGIC++++//, who has 21 National titles. MAGIC AULRAB's sire AULRAB is also the sire of U.S. National Champion Sport Horse Stallion, multiple National Champion Dressage and Top Ten Working Hunter and National winner sire OTB AURYAN++/, who is out of a linebred *BASK++ mare as is MAGIC AULRAB. AULRAB is by Pacific Slope Champion Formal Driving AURAB, sire of 14 National winners including National Champions in halter and working hunter.? MAGIC AULRAB has two lines to AURAB. 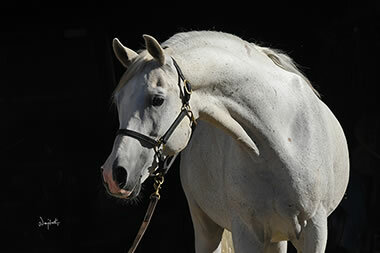 AURAB is a paternal brother to U.S. Top Ten Stallion CARLANI. AULRAB is a full brother to multiple Top Ten Hunt Pleasure and Sidesaddle and National Champion sire HI VOLTAGE+//. MAGIC AULRAB is out of western pleasure champion PHYLLIS DREAM, a paternal sister to National Champion producers MAGIC ALARIEHA (dam of AUL MAGIC+//), to ALEEIAHA (dam of National Champion Sport Horse Show Hack and Second Level Dressage AUR MYSTIC ILLUSION+//), to DJ MAGIC (dam of multiple National Champion Dressage and Top Ten Working Hunter AF THE MAGICIAN+/),? and to BH MAGIC SERENADE (dam of National Champion Western Pleasure MAGIC VANITY+/). 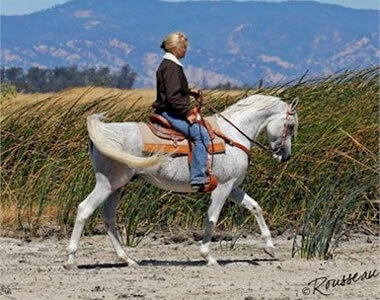 PHYLLIS DREAM is by U.S. National Champion Western Pleasure *LEWISFIELD MAGIC+/, a sire of a National Champion in native costume and a multiple National winner in sidesaddle. *LEWISFIELD MAGIC+/ is by British National Champion Stallion and National Champion sire INDIAN MAGIC, one of the most significant stallions bred at England's Crabbet Stud. *LEWISFIELD MAGIC+/'s dam *MICHELIA produced 3 National winners (the other two are Top Ten winners in english pleasure). PHYLLIS DREAM is out of AURA DE AUR, a full sister to halter champion KHANDA+/, dam of regional dressage champion KHALAHARI PROOF+, also successful in all breed dressage competition. AURA DE AUR is by National Champion sire ?AURAB. AURA DE AUR is out of DIENS, dam of National winner producer ECHOS HEIRESS (dam of multiple Top Ten Halter winner PT ECHO+). DIENS is a full sister to multiple regional western pleasure winner RAZIZ++ and to AURION, sire of U.S. Top Ten Prix St Georges Dressage JAVA GEORGE. DIENS is a paternal sister to Top Ten Western Pleasure and Sidesaddle AURIC++. AURELIUS GOA's dam PROBERRY BEY also produced multiple regional champion halter and regional western pleasure winner FIRE N GLORY+ and 11 time regional country pleasure champion DALTREY GHA. PROBERRY BEY is a 3/4 sister to National Champion Country Pleasure AFFIRMATIV ACTIONN, to multiple Top Ten Country Pleasure AFIRES CENTURIAN, to U.S. Top Ten English Pleasure Futurity MISTAKEN IDENTITY GBR, to multiple Top Ten English Pleasure and National Champion sire FORREST AFIRE and to U.S. Top Ten Show Hack JOTR AFIRELIGHT, dam of National Champion Sport Horse Under Saddle, multiple National Champion Sport Horse In Hand and Dressage RAAYDER++++// (who has 18 National titles) and of seven time National winner FURSTAFIRE++++// (National Champion Sport Horse In Hand & Dressage Prospect and multiple Top Ten Dressage). PROBERRY BEY is out of CLASSICALLY YOURS, also dam of Canadian National Champion English Pleasure and U.S. Reserve National Champion Informal Combination MD PRO-AEQUUS and of Reserve National Champion Park and English Pleasure MD AQUARIUS, all of whose offspring are National winners including Reserve National Champion English Pleasure COUNTESS DE BLACK and National Champion English Pleasure BORNE THIS WAY (who has 13 National titles). PROBERRY BEY is a daughter of U.S. Top Ten Park AFIRE BEY V,? the breed’s all time leading sire of champions and National winners with 323 purebred National winning get as of the end of the 2018 show season. AFIRE BEY V has sired National Champions in halter, sport horse in hand, park, English pleasure, country pleasure, pleasure driving, country pleasure driving, show hack, hunt pleasure, and English sidesaddle.? He has sired Top Ten winners in dressage and trail. 104 AFIRE BEY V daughters have produced National winners through the end of the 2018 show season, and 45 of them are National Champion producers. AFIRE BEY V is by U.S. Reserve National Champion Futurity Colt and English Pleasure HUCKLEBERRY BEY++, sire of 104 National winners. His dam AUTUMN FIRE, is the top producing daughter of *BASK++ with 13 champions, 9 of them National winners and 7 offspring who have produced National winners.? 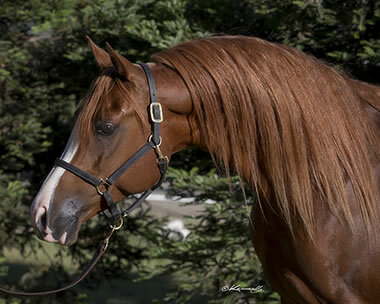 U.S. National Champion Stallion and Park *BASK++ was the breed’s leading sire of champions for over 30 years until his grandson AFIRE BEY V surpassed his record. AUTUMN FIRE is out of 1975 Pacific Slope Reserve Champion Park and Champion Formal Driving SPARKLING BURGUNDY, a daughter of U.S. Reserve National Champion Stallion FADJUR, a sire of National Champions in halter and performance and grandsire of U.S. and Canadian National Champion Stallion and Western Pleasure KHEMOSABI++++//, who was at the time of his death the breed’s leading living sire of champions. CLASSICALLY YOURS is by U.S. National Champion Park and Reserve National Champion Formal Combination PRO-FIRE, sire of 50 National winners including National Champions in English pleasure, park, pleasure driving, native costume, english sidesaddle, dressage and trail. His son SUPREME DECISION+// has 23 National titles in Half-Arabian Park, 12 of them National Championships. PRO-FIRE is also a noted broodmare sire, with 33 National winner producers, 21 of them mares. His top producing daughter FIRE ESSENSE is the dam of 9 champions, 7 of them National winners and 4 of them National Champions. His daughter PROS DREAM produced 9 champions, 8 of them National winners.? Another daughter, National Champion English Pleasure LA QUINTINA, has produced 6 champions, 4 of them National winners. 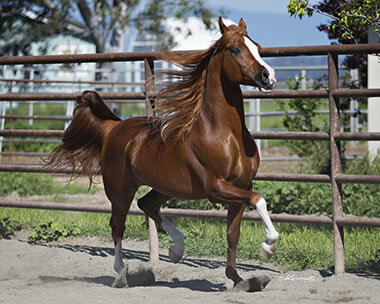 PRO-FIRE is by U.S. National Champion Stallion and Park *BASK++. PRO-FIRE’s dam, U.S. National Champion Park *PROWIZJA, is the breed’s top dam of National Champions in park, as four of her sons have national championships in that division. 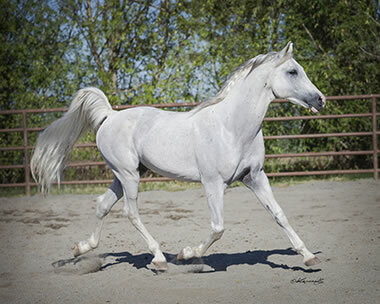 CLASSICALLY YOURS is out of KWIECZYN, whose daughter KARIZMAH produced 20 time regional western pleasure winner CONTINUOUS CHARISMA+, a multiple regional champion. KWIECZYN is by halter reserve champion GWYDION, sire of National winners in halter and hunt pleasure. KWIECZYN's maternal sister MA EQUITY produced 2 National winners including Top Ten Second Level Dressage and three times Top Ten Sport Horse Show Hack CYEZE THE DAY+/. All four of KWIECZYN's grandparents are National winner producers. AURELIUS GOA has a solid pedigree of successful athletes! PC DONOVAN is a son of AZH NABORR, sire of National winners in sport horse in hand and in performance. They include Canadian Top Ten Pleasure Driving and U.S. Top Ten Informal Combination BELLA AZH NABORR and multiple U.S. National Champion Half-Arabian Sport Horse Stallion THE TERMINATORR+ and to U.S. Top Ten Half-Arabian Sport Horse Mare, Sport Horse Show Hack and Dressage AZH NABORRS GEMINI++. AZH NABORR get have produced National winners in North America and Europe. In North America his son THE TERMINATORR+ sired 8 time National winner HERMES ECHO++++//, a Top Ten winner in Sport Horse In Hand, Sport Horse Under Saddle and Dressage. AZH NABORR has two daughters who have produced North American National winners. NABORRS FASHION produced multiple National Champion Sport Horse Carriage Driving NABORS GREY TANDOLYN+++/. MEA AZARIEH is the dam of National Champion Western Pleasure and Hunt Pleasure and multiple Top Ten Western Sidesaddle MAHIJAH BEY++/. AZH NABORR has made a significant contribution to the breeding of some of the most beautiful horses in Europe through two of his daughters. His maternal grandson CH EL BRILLO is a highly successful sire of European show winners. Among his get are Austrian National Champion Stallion and Wels International Champion Stallion LORENZO EL BRI; Nations Cup Champion Filly and European Reserve Junior Champion Filly and National Champion producer REZA EL BRI; Austrian National Champion Colt and Wels International Reserve Champion Colt MM FABRIZIO (also a multi-champion in Italy); Austrian National Champion Mare ANAIS EL BRI(dam of *ARMANDO DE ARYES, a Canadian National Champion in halter and three time National winner in western pleasure); Austrian Silver Champion Mare GALINKA DE LA ROUGE; and Austrian Gold Champion Stallion GALINKA EL SHEIKA. 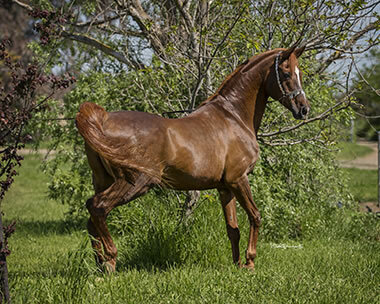 AZH NABORR is also the maternal grandsire of World Reserve Champion Colt, European Junior Champion Colt and Middle East Reserve Junior Champion Colt OM EL AZADIK, a sire of champions in the Middle East including Ajman National Champions RABBA, MONEAT ANNAFS and EL BAZ, and UK International Champion Mare and Nations Cup Top Five Mare MA BINT AZADIK. ?OM EL AZADIK is the sire of the third dam of ?World Silver Champion Stallion and European and Dubai Gold Champion Stallioin SHANGHAI EA, sire of World and National Champions. AZH NABORR's sire *NABORR was one of the most influential stallions imported from Poland (though he was bred in Russia). *NABORR get won National Championships in halter, western pleasure, dressage, english pleasure and park. They also won Top Ten titles in reining and cutting. Among them are U.S. National Champion Stallions *ARAMUS++ and GAI-ADVENTURE (both also National winners in performance), U.S. National Champion Mare and Reserve National Champion English Pleasure *DORNABA++, multiple National Champion Stallion and Park *GWALIOR++, and World Champion Stallion, Canadian National Champion Stallion and Western Pleasure and twice U.S. Reserve National Champion Stallion KABORR+++. AZHDERIANE's dam JAZABELLE is by AWIZ. Four of his daughters have National winners tracing to them. AWIZ is closely related to twice Canadian Top Ten Gelding FARO IBN WITEZ II++, who is also by *WITEZ II out of a KATAR granddaughter. 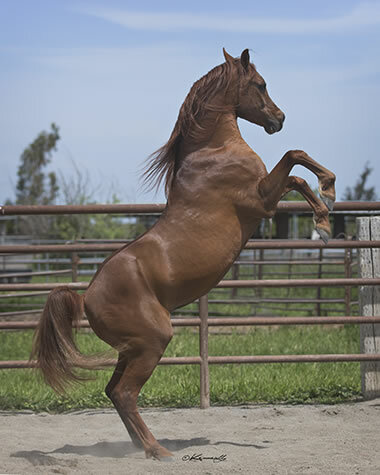 His sire, Pacific Coast Champion Stallion *WITEZ II, sired 16 National winners including National Champions in halter. 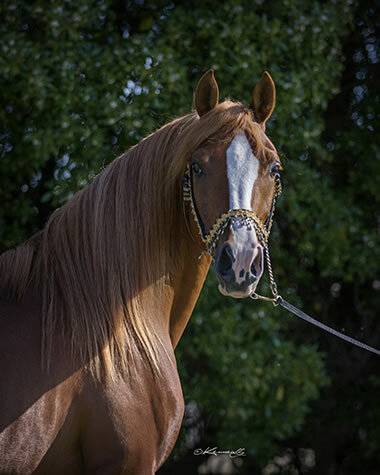 AWIZ is a maternal brother to National winner sire ILID ILAHAD, whose daughter SHANTU++ is a U.S. Top Ten English Pleasure winner and dam of 2 National winners in halter. JAZABELLE is out of champion producer FASEYN, dam of 2 National winner producers including BAHNA, dam of U.S. National Champion Mare and National winner producer RAHBAHNA++. PC DONOVAN is out of the pure Polish mare GA DESERT SHIELD, who is linebred to National Champion sire WIELKI SZLEM. Her daughter PC BATON ROUGE is a reserve champion in halter. GA DESERT SHIELD is a daughter of five time stakes winner SIR WM BOGDAN+, sire of country pleasure champion HEART A DIXIE, multiple race winners LOCAL TALENT, BIALKA and ZYNZATION and stakes winner producer POLISH RYE from just 17 registered get. SIR WM BOGDAN+ is linebred to multiple Polish stakes winner CZORT as his sire is a son of CZORT and his dam is a paternal granddaughter. He has sired more Polish Classic winners than any other sire. SIR WM BOGDAN+ is by one of CZORT's best sons, *SAMBOR++, a U.S. National Champion Racehorse and regional halter and park winner. *SAMBOR++ was CZORT's most influential son in American Arabian racing but he also had influence on show winners, siring National winners in western pleasure and park. He is the grandsire of U.S. National Champion Stallion and National Champion sire? MS SANTANA. *SAMBOR++'s dam *SABELLINA won the Polish Derby and Oaks. Her direct offspring won 12 stakes races in Poland and National titles in America. She is considered one of the most influential mares in production of successful racehorses worldwide (as is FORTA, CZORT's dam, who produced more race winners than any other mare in Poland and was also the dam of National winners in halter and performance). SIR WM BOGDAN's dam *GROTESKA also produced the regional champion producer A O KOHL. Her sire *BANZAJ is by CZORT out of National Champion producer BANDOLA, a fuil sister to U.S. National Champion Stallion and Park *BASK++. *GROTESKA's dam GWARDIA is by Polish Derby winner BRANIBOR out of GWARA, dam of 6 National winner producers. GA DESERT SHIELD is out of *LALGA, dam of race winner GA NONPAREIL. She is a 3/4 sister to Swedish National Champion Stallion and multiple race winner ALGORYTHM, whose get have won National titles in Sweden and produced National Champions in Europe and the Middle East as well as Swedish Best Racehorse PROGRAM.? *LALGA's sire *ALGOMEJ is a Swedish National Champion Stallion and Polish Reserve National Champion Stallion. He has sired winners in Europe and North America in the show ring and on the racetrack. In the USA *ALGOMEJ grandget include LITTLE RED KHORVETTE+//, who has 20 Sport Horse National titles including multiple National Championships in Sport Horse Under Saddle, Hunter Hack and Hunter Over Fences). ? *ALGOMEJ grandget in the U.S.A. have won National titles in halter, english pleasure sport horse in hand, hunt pleasure, dressage and reining (including U.S. Reserve National Champion Reining JTR 14-17 at age 20 PAUILLAC+/). *ALGOMEJ *ALGOMEJ is a full brother to Polish National Champion Mare and multi-National Champion producer ALGERIA (dam of Dutch National Champion Stallion? and National Champion sire ALEGRO) and a 3/4 brother to Polish National Champion Stallion and National Champion Sire *ALOES (sire of U.S. Reserve National Champion English Pleasure and National Champion sire *EL GHAZI). *LALGA's dam LEWA is a paternal sister to World, European and Swedish National Champion Stallion *RUSAZCIE, sire of three Swedish National Champion Mares. Her sire ALGIER is a paternal brother to U.S. National Champion Stallion *BASK++ and his dam produced 4 National winner producers. LEWA is out of ALEKSOTA, dam of Swedish National Champion Stallion and National Champion sire ALGORYTHM. ALEKSOTA is by NEGATIW, sire of *NABORR. PC DONOVAN comes from a carefully planned, highly athletic heritage. Echo is a 15.1h stallion with extremely correct legs, and unbelievably uphill movement. Floats like a cloud, and is supple as a snake.. He will charm you with his kind and loving temperament, but he will blow you away when you see him move!! ECHO ER RIH won two regional championships in 2009, as he was named both Pacific Slope and Region 3 Champion Sporthorse Stallion in Hand. His heritage combines the best of Polish and CMK blood from lines noted for their athleticism, versatility and durability. His ancestors have won or produced winners in the show ring, on the racetrack and on the endurance trail. ECHO ER RIH is by the 75% Polish stallion LANCE ER RIH, a paternal brother to STAR ER RIH, a blue ribbon winner in country pleasure. LANCE ER RIH is by pure Polish ELSINOR VALENTINO, a 3/4 brother to U.S. Top Ten Stallion WA FOOLS GOLD. ELSINOR VALENTINO is by U.S. and Canadian Top Ten English Pleasure BARZIK++, a son of Canadian Top Ten Stallion and U.S. Top Ten Native Costume *BARYSZ++. BARZIK++'s dam *GORCZYCA is a 3/4 sister to multi-National Champion in halter and park * GWALIOR++ . ELSINOR VALENTINO is out of performance champion ELSINOR CZORTA, dam of hunt pleasure AOTR champion and blue ribbon dressage winner RY ELETE. She is a maternal sister to National winner producers *DOKTRYNA (dam of U.S. Top Ten Formal Driving BASQUEZ) and BOLD BRILLIANCE (dam of WA FOOLS GOLD). Her sire *GRAWER+ is a U.S. Top Ten Park winner. LANCE ER RIH is out of HOPE ER RIH, a paternal sister to Swedish National Champion Stallion DYLEMAT and to 10 time National winner *WILCZUR+/ (whose titles include Canadian Reserve National Champion Pleasure Driving AOTD, U.S. and Canadian Top Ten Park and U.S. Top Ten Formal Driving). HOPE ER RIH is by the Polish import *GEDYMIN, son of the National winner producers GWARNY and GASTRONOMIA. HOPE ER RIH is out of DESERT VELVET, dam of race winner GOLD HONEY B. GOLD HONEY B is the dam of race winner JEST BEEKEZZ, multi-race winner D J McB, and of multi-race winner and stakes placed JUST LIKE MC. She is a paternal sister to National winner sire BELESEMO TRAD, whose son BELESEMO EPIC++ is a U.S. Top Ten Sporthorse Stallion ATH. DESERT VELVET is also a paternal sister to the exceptional endurance mare AMIRI TRKEETA+/, who has 2,665 ride miles in 51 rides with 51 completions and 15 Best Condition awards! 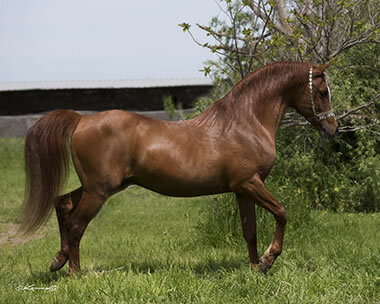 Her dam HARAMIYA is the dam of the Half-Arabian halter and western pleasure champion GO JO GO. She has 4 lines to *RASEYN through three different sons, all National winner sires (FERSEYN, GAMHURI and TAJ-MAHAL). ECHO ER RIH is out of LIBRTY ER RIH, a son of the CMK stallion PAIUTE WARRIOR. His sire HYATAK is a full brother to HYAK, grandsire of the National winners JO-VALL (Canadian Top Ten Mare) and TWAZI++ (Canadian Top Ten Stallion and a National Champion sire). HYATAK is a maternal brother to RODANNA, dam of U.S. Top Ten English Pleasure and National winner sire PRINCE HALLANY++. HYATAK's dam RAFA is the granddam of SONI, who produced 2 National Champions: Canadian Reserve National Champion Formal Driving and Top Ten Park RIFSON and Canadian National Champion Pleasure Driving TWIN FIR ELEGANCE+. 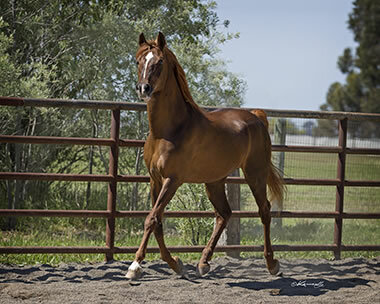 PAIUTE WARRIOR is out of DARMONA, a 7/8 sister to DARLEZ, sire of U.S. Reserve National Champion Half-Arabian Trail and twice Top Ten Stock Horse TWILEZ. DARMONA is also a paternal sister to AABELLE, dam of U.S. Reserve National Champion Stock Horse TANTANA. 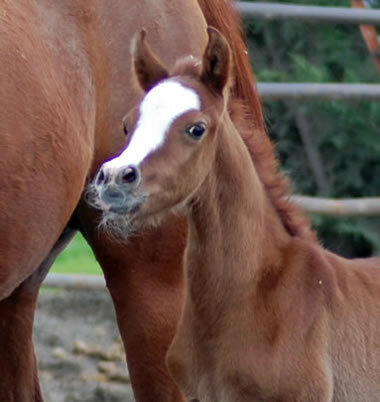 DARMONA's sire BELLEZ is a full brother to U.S. Top Ten Western Pleasure BELINDA (dam of U.S. National Champion Futurity Filly OTHER EDEN) and to BELLEZA (dam of Canadian National Champion Stallion and U.S. Reserve National Champion Stallion ZARR-HASSAN+/). 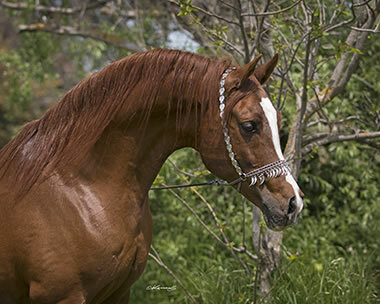 DARMONA's dam MOUNWIRA is a 3/4 sister to MAYADIN, dam of Canadian National Champion Western Pleasure and Western Pleasure AOTR DARGARIO and U.S and Canadian Reserve National Champion Stock Horse DARODAN. MOUNWIRA is also a paternal sister to U.S. Top Ten Stallion and National Champion sire MOUNRI and to MOUNIGHA (dam of U.S. National Champion Trail and National Champion producer PICO MOON+). LIBRTY ER RIH is out of E-MISCLE, whose daughter REQUESTED produced Half-Arabian hunt pleasure champion TU HOT. E-MISCLE's full sister MIS RAFFI is the dam of regional western pleasure winner AZA RAINDANCER. E-MISCLE is by CLIQUOT, a paternal brother to Canadian Top Ten Mare SOTARA++, C anadian Top Ten Stallion KORIE, Canadian Top Ten Stallion and Native Costume NA MASUMA, U.S. National Champion Futurity JR NICHOLAS++, and to Canadian Reserve National Champion Stallion NA MASUMA. CLIQUOT's dam SHAI TAN also produced regional performance winner SUN TAN. She is a full sister to ALLAKAR, dam of Canadian National Champion Park AOTR and Formal Driving JOAL, who has 6 National titles. E-MISCLE is out of MISTAM, whose maternal sister ZEINA is the dam of ZEINETTA, who has produced 4 champions. ZEINETTA's son CYRYS+// is a U.S. National Champion Country Pleasure and Reserve National Champion First Level Dressage winner and has 11 National titles. MISTAM's sire MISTANNI also sired the Half-Arabian mare MISTANNIS FATIMA, dam of two National winners: six time Half-Arabian National winner in English pleasure and pleasure driving BEAU BRILLIANCE++/ and Canadian Reserve National Champion Half-Arabian Stock Horse JURIME. MISTAM is out of TAMALLI, a full sister to 2 National winner producers: BERSIM (dam of Canadian Top Ten Stallion WALLA NAR++) and TANONAH (dam of Canadian National Champion Gelding STAR TRAK++). TAMALLI is also a maternal sister to NADONA (dam of Canadian Top Ten Gelding SYNDAD MI-SHAQ++). ECHO ER RIH's ancestors predict future success for him as both a show horse and sire. Pride is now a SHIH champion from his first show. He passes on his kind temperament, elastic movement and courageous soul to his foals. 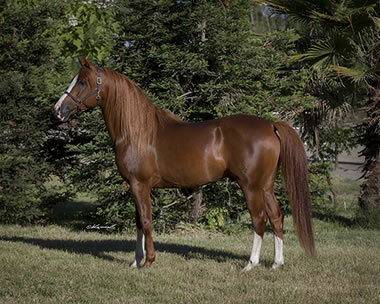 PRIDE ER RIH is an Egyptian related stallion whose dam side pedigree contains linebreeding to some of the best early American racing stock bred by the Lucas family as well as lines to the National winners and National Champion sires FADJUR and NATEZ. PRIDE ER RIH is by *E H ADNAN, also sire of the successful endurance horse RAZZNAN (5875 career miles in 118 rides with 113 completions and 3 Best Condition awards). *E H ADNAN is by EL ABD, a paternal brother to *NORUS, sire of World Champion Stallion and National Champion sire HADIDI. 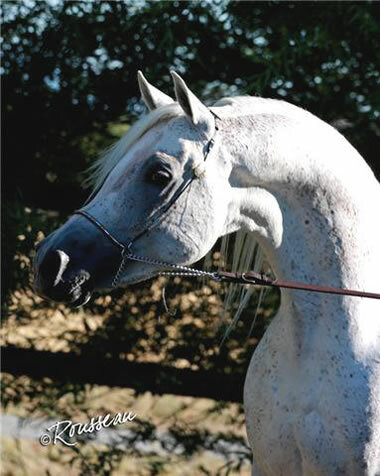 EL ABD is also a paternal brother to Scottsdale and Buckeye Champion Stallion *SHAREM EL SHEIKH, sire of U.S. National Champion Stallion ETERNETY+. EL ABD's dam EL GARIA is by IBN GALILA, a paternal brother to National winner sire and grandsire *GHALII. Her dam NOOSA is a paternal sister to U.S. and Canadian Top Ten Western Pleasure *SAROUKH++. *E H ADNAN is out of ADAM KHEIR. ADAM KHEIR is a full sister to *BASSIMA EAO, dam of 3 champion producers. Her daughter DM MIMOSA produced multi-regional dressage winner BG MAASAI. Another daughter, *SHALOM ILANIT, produced 3 champions: regional dressage champion SHALOM MA-AJAN, champion jumper SHALOM SHOSHANAH, and SHALOM ILANAH, whose 8 regional wins include titles in sporthorse halter and a regional championship in hunt pleasure. ADAM KHEIR is by KAYED, whose daughter *IMPERIAL SAYYAH is the maternal granddam of Middle East Champion Mare KAMASAYYAH and of World Champion Stallion *AL ADEED AL SHAQAB. KAYED also sired *LANCERS EL SHADI, sire of Canadian Top Ten Hunter SHARENDOUS. 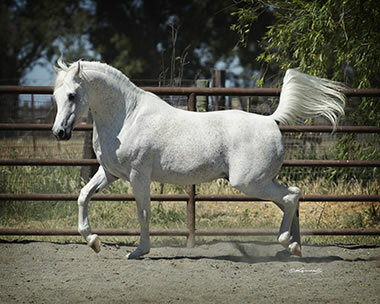 Another KAYED daughter, *SAMIAA, is the maternal granddam of U.S. Reserve National Champion Sporthorse Stallion and National Champion sire LEGEND OF KHOURAJ. ADAM KHEIR is out of BINT RAWYA, also dam of IBN SHAKER I, maternal grandsire of U.S. and Canadian Top Ten Stallion, Canadian Top Ten Country Pleasure and Egyptian Event Supreme Champion Stallion *ORASHAN. BINT RAWYA's daughter *SHALOM HA YONAH produced 4 champions: champion hunter SHALOM AMNON, Region 18 Reserve Champion Jumper SHALOM TIKVAH, U.S. and Canadian Top Ten Jumper and regional dressage winner SHALOM FEYAH+, and Canadian National Champion Medium 1 and Medium 2 Dressage SHALOM YAROM+/. PRIDE ER RIH is out of RAPTURE ER RIH, who is linebred to horses from the program of the Lucas Arabian Stud, one of the leading early breeders of American racehorses. She traces in sire line to NUSABRE, whose race record is 6/34 (10-5-9) and who sired 15 race winners including 4 times California Horse of the Year SABRE CHANT. Two NUSABRE daughters are members of the Racing Hall of Fame- LAS TIGRE LIL (dam of 4 stakes wiunners) and LAS HILARE (dam of 3 stakes winners including SAYHI MC aand IAM NO FOOL). RAPTURE ER also has lines to NUSABRE's full sister NUGALAXY and two lines to his paternal sister NULAANA. She traces in trail female to NUSABRE's dam NEVADA STAR, who produced 4 race winners. RAPTURE ER RIH is by MACHO FORTY FOUR, a paternal sister to race winner GOLD HONEY B, dam of race winner JEST BEEKEZZ, multi-race winner D J McB, and of multi-race winner and stakes placed JUST LIKE MC. MACHO FORTY FOUR is out of FANTASMIGORICA, a maternal sister to halter champion CAL O-FIRE. 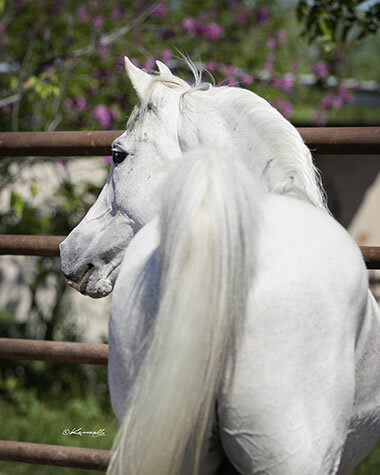 She is by U.S. Reserve National Champion Stallion FADJUR, sire of 18 National winners. 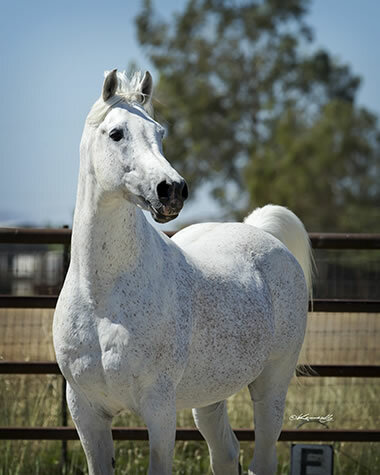 The FADJUR grandson KHEMOSABI++++//, a multi-National Champion in halter and western pleasure, was recently rated the top Arabian sire of dressage winners in a study in Modern Arabian Horse. FANTASMIGORICA is out of RED SAILS, a paternal sister to ROSE OF SHANNON, maternal granddam of U.S. Top Ten Jumper SON OF ERIN and of ERINS BELLE, dam of a National Champion in hunt pleasure. RAPTURE ER RIH's dam RAPSODI ER RIH is a paternal sister to FA WILDFLOWER, dam of race winner WILD WIN, who finished in the money in 20 of 21 races. 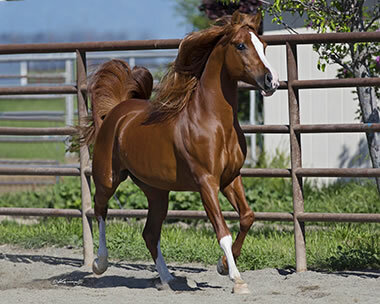 RAPSODI ER RIH is by NZ SERENDIP, a paternal brother to U.S. National Champion Mare INDIAN GENII and multi-U.S. National Champion Cutting KOBIR WAHID. NZ OF SERENDIP is a maternal brother to PRINCE SERAFIX (sire of National winner producer RED HOLLY EPONA). His sire NATEZ is a U.S. Top Ten Stallion, and his dam, champion producer NATTILA, is a paternal sister to National winners in trail and native costume. Her sire EL BIERNATT is a Canadian Top Ten Stallion and is 75% Polish. 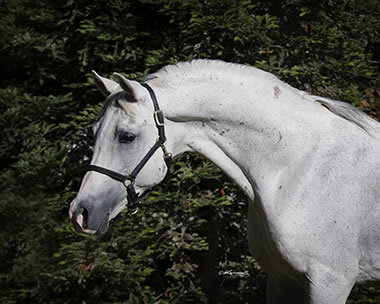 RAPSODI ER RIH is out of NUGAL, the maternal granddam of ALLANDA, whose son SHIKHOS ALLADAR+ is a U.S. Top Ten First and Second Level dressage winner. PRIDE ER RIH is from a pedigree proven on the track and in the show ring. way and just as confident as he is! Straight Egyptian ZAHIN HAALIM has been shown three times in halter and placed second each time. His pedigree contains two lines to *SULTANN, the only Egyptian stallion to sire three U.S. National Champions in performance, and both his sire and dam trace to *SULTANN in sire line. He also has three lines to halter and park champion *MORAFIC, the all time leading imported Egyptian sire of National winners and National winner producers. 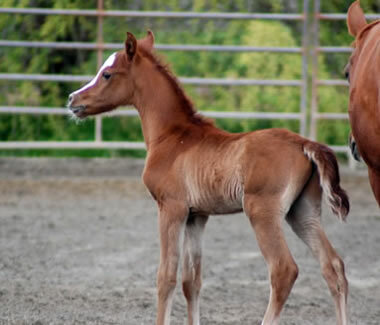 ZAHIN HAALIM is a paternal brother to 8 National winners: U.S. Top Ten Futurity Colt MAAHRUS+, U.S. Top Ten Sweepstakes Colt and Futurity Colt MAKHNIFICENT KA, Canadian Reserve National Champion Futurity Colt ZAARIF, U.S. National Champion Futurity Colt KURAAFI, U.S. Top Ten Hunt Pleasure Futurity BODACIOUS KA, U.S. Top Ten First Level Dressage AOTR and Second Level Dressage ATR KA FIRST KNIGHT++/ twice U.S. National Champion Western Pleasure Walk/Trot and U.S. Top Ten Western Pleasure JTR 13/Under BINT HADDIYAH+/, and twice U.S. National Champion Working Cow Horse AOTR, twice U.S. Reserve National Champion Working Cow Horse AOTR and four times U.S. Top Ten Working Cow Horse ZIBA JALISA+. He is also a paternal brother to the National winner producers MARQUIS I (sire of Canadian Top Ten Jackpot Colt EL MASRI BJ), DAVINCI KA (sire of U.A.E. Junior Champion Filly R.S. KASIBA), CALYPSO DANCE (sire of U.S. Top Ten Stallion AOTH KMF ALI CALYPSO) and SCHEHERAZADD (dam of Canadian Top Ten Futurity Filly SCHAARIKA, U.S. Top Ten Mare JOTH ROHARA DIVA, and U.S. Top Ten Futurity Filly and Mare AOTH and National winner producer ROHARA SHAHZADDA). 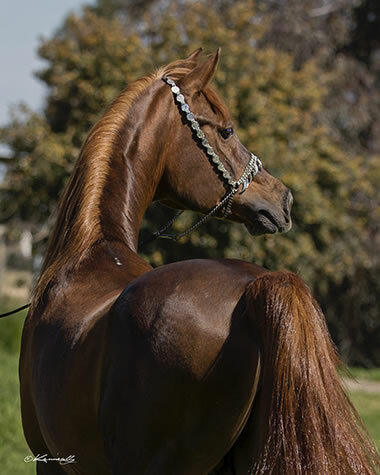 ZAHIN HAALIM's sire MAKHSOUS is by *SULTANN, sire of U.S. National Champion Sidesaddle and Reserve National Champion Native Costume *MANZOURA, 14 time National winner and National Champion sire *SAKR+++ (a multi-National Champion in park and native costume as well as a U.S. Top Ten Stallion), and *ASADD++, the only straight Egyptian stallion to be a U.S National Champion Stallion and also a U.S. National Champion in performance (English pleasure). He is also a sire of National Champions in halter and performance. MAKHSOUS is out of *NABDA, also dam of multi-halter champion WALAD NAGID (a ribbon winner in hunt pleasure, western pleasure and country pleasure). *NABDA is a 3/4 sister to U.S. National Champion Western Pleasure and Top Ten English Pleasure *NIHAL++ and to *RAMSES NAGDIA, whose daughter RAMSES TINAH is a National Champion producer in Australia. Champions in halter and multi-National Champion Jumper SCHZARAD THUNDOR. NABIEL+/ is by multi-National Champion *SAKR+++ out of *MAGIDAA, dam of 4 champions and 3 National winners including NABIEL+/'s full brother SUGAA++/ (a multi National winner in English pleasure and pleasure driving), U.S. National Champion Futurity Filly SHAFEEKAH, and halter reserve champion BINT MAGIDAA, dam of 7 champions including U.S. Reserve National Champion Stallion RUMINAJA ALI. 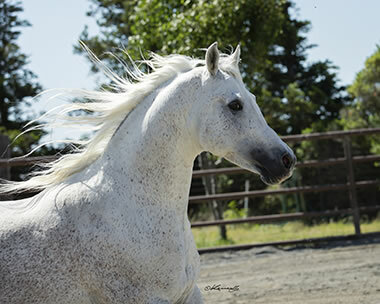 FAKIHA is out of FOULA, a full sister to champion producers ZAENAP and AK BINT HOYEDA and a paternal sister to Canadian National Champion Western Pleasure and U.S. Reserve National Champion Western Pleasure ALMILEEGY++ and U.S. Reserve National Champion Native Costume GAMAL AL ARAB++. FOULA is a maternal sister to multi-regional halter winner MONIET EL NAFIS , who sired more straight Egyptian race winners than any other stallion, including stakes winners IMPERIAL NA LASEEF and ZT ALI BABA+/. This is a truly athletic heritage! Thanks to Arlene Magid for research, www.arlenemagid.com.